The colossal plants and animals of our world—dinosaurs, whales, and even trees—are a source of unending fascination, and their sheer scale can be truly impressive. Size is integral to the way that organisms experience the world: a puddle that a human being would step over without thinking is an entire world to thousands of microscopic rotifers. But why are creatures the size that they are? Why aren’t bugs the size of elephants, or whales the size of goldfish? 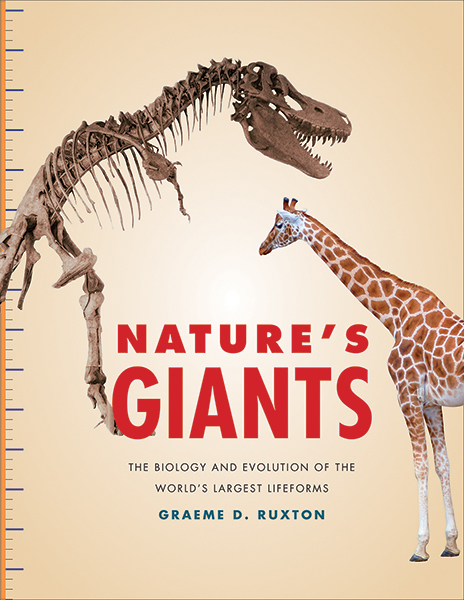 In this lavishly illustrated new book, biologist Graeme Ruxton explains how and why nature’s giants came to be so big—for example, how decreased oxygen levels limited the size of insects and how island isolation allowed small-bodied animals to evolve larger body sizes. Through a diverse array of examples, from huge butterflies to giant squid, Ruxton explores the physics, biology, and evolutionary drivers behind organism size, showing what it’s like to live large. Graeme D. Ruxton is professor of biology at the University of St. Andrews in Scotland and fellow of the Royal Society of Edinburgh. Norman Owen-Smith is Emeritus Research Professor at the University of the Witwatersrand and fellow of the Royal Society of South Africa. “We are dwarfed by many animals, from the blue whale to the mighty Tyrannosaurus rex. Size poses its own physical challenges as expertly explained by Graeme Ruxton in a book chock-full of fun facts about the biggest animals and the reasons for their success or failure in the natural world.”—Frans de Waal, author of Are We Smart Enough to Know How Smart Animals Are?